Zambia striker Emmanuel Mayuka has only a 50% chance of playing any further part at the 2015 Africa Cup of Nations because of a groin injury. The 24-year-old, who plays his club football for Southampton, was injured in Thursday's 2-1 loss to Tunisia. Zambia communications manager Nkweto Tembwe told BBC Sport the team doctor will decide in the next 24 to 48 hours whether Mayuka can play on Monday. Chipolopolo must beat Cape Verde for any chance of a quarter-finals spot. Mayuka was taken straight from the stadium to hospital in Ebebiyin during Thursday's game, although he is now back with the team at their hotel. 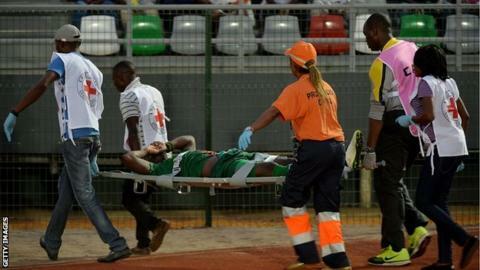 He injured himself stretching to reach the ball as he attempted to give Zambia a 2-0 lead. Moments later Tunisia drew level through Ahmed Akiachi, and they went on to win the match and leave Zambia without a point from two games.